Despite worldwide protests and rallying in support of saving his life, Troy Davis was executed by lethal injection on September 21, 2011. This came twenty years after he was convicted of killing police officer, Mark MacPhail on the night of August 19, 1989. Davis was buried on October 2, 2011 in his home-town of Savannah Georgia. His funeral was attended by over 1,000 people who were supporters and pledged to keep fighting to prove his innocence. He was celebrated as a martyr and a leader in the battle to abolish the death penalty and clear his name. The funeral took place at Jonesville Baptist Church, in the historic pulpit where Martin Luther King Jr. preached non-violence. 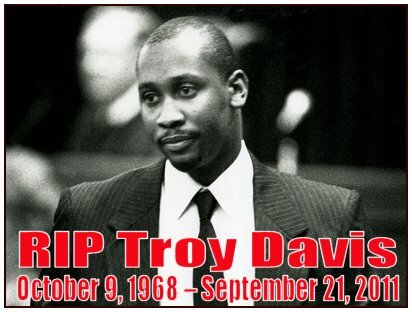 Many supporters attended the service wearing T-shirts that said “I AM TROY DAVIS”. This was the slogan that supporters used in the fight for all those wrongfully convicted and facing execution in the flawed system of justice. Benjamin Todd Jealous, president of the NAACP, spoke to the fact Davis maintained his innocence even to the final minute. He said, “Troy’s last words that night were that he told us to keep fighting until his name is cleared in Georgia….keep fighting until the death penalty is abolished and this can never be done to anyone else.” It was reported that before the lethal injection was administered, Davis looked at the family of the murdered police officer, Mark MacPhail, and maintained he was not the person who killed him. In a case surrounded by so much doubt it has caused many to question the validity of the death penalty. If a person is found innocent after already being executed, there is no turning back. Nobody can bring that person back to life. Thousands around the world supported Davis’ plea for another trial. Since the 1991 conviction, seven of the nine witness have changed their story. There was also no physical evidence tying him to the crime. The court appeals took four years and even though his execution was delayed by hours, ultimately the Supreme court upheld the original conviction and the death sentence. Even with the support of Amnesty International, Pope Benedict XVI, Archbishop Desmond Tutu, and former U.S. President Jimmy Carter the conviction was still upheld. At the urging of Amnesty International, supporters wore armbands that had ‘I am Troy Davis’ written on it. The funeral on Saturday was more about the continuing fight to clear Davis’ name. It wasn’t a gloomy ceremony. But a celebration of his life and the mission to continue working to change the laws regarding the death penalty. Although abolished in many places, the United States still has several states that practice Capitol Punishment. This puts the U.S. among countries like Saudi Arabia, Iran, Libya, China and Yemen, who still uphold the practice of execution. Do you think that there is justice by practicing the death penalty? I’d love to hear your thoughts.